The shovelhead motorcycle engine is one that many custom chopper owners are proud to own. This V-Twin powerhouse was manufactured by Harley Davidson beginning in 1966 and ending in 1985. 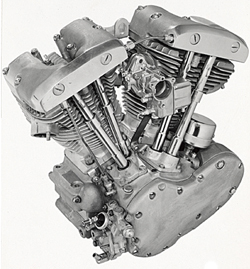 This engine reflected refinements from the other types of V-Twin engines Harley had produced such as knucklehead and panhead engines. The "shovel" represented an offshoot of the panhead engine design but featured a slightly different look. The name of this engine was derived from the appearance of the rocker box covers. Because these covers bring to mind the head of coal shovels when inverted, the name shovelhead seems to simply be a natural progression. The shovel engines powered Harleys up until the introduction of the Evolution power house in 1985, ending the reign of the "shovel" as enthusiasts frequently call these engines. The shovel engine does not have covers, per se, but rocker boxes and rocker arms which pivot on shafts. 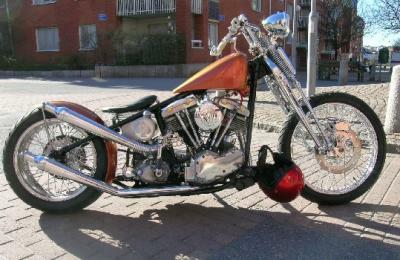 The design provided more than a unique look; it is slightly more powerful than the panhead engine which it replaced. Originally designed to fit Sportster motorcycles, the pan began to lose popularity as Harley owners began to demand more horsepower. Harley accommodated these demands with the introduction of the shovel head. There was some controversy about the weight of the new model and, even today, some dealers in classic motorcycle parts steer away from the shovel configuration because they feel it is slightly slower and less powerful than some of the other Harley models. By the mid-1960s, the popularity of custom choppers had begun to reach an early peak. The new top end provided power and acceleration sought by the custom bike enthusiast, in spite of the controversy. The shovelhead engine's weight and proximity to the pavement did affect the steering of the motorcycle somewhat. When used in custom choppers, riders who loved high speeds found the bike would begin to weave. Of note, the shovelhead engine powered the FLH Electro-Glide model of Harley Davidsons which included electric start. These were the motorcycles of choice for many police departments and law enforcement agencies during the years of production. They were also the impetus behind the still-watched "Electro-Glide in Blue" feature movie starring Robert Blake as the law enforcement officer who rode the blue Electro-Glide. The Shovelhead Engine Remains Popular Among Classic Motorcycle Enthusiasts! These engines can be found in some really great looking motorcycles. You can also find them at times as just an engine or, more frequently, as a basket case. It can be well worth your time and labors to build this engine, now considered to be antique since the last ones are over 20 years in age, even if you have to go from the basket of parts up to a running engine. You can house your shovel head engine in a stock Harley Davidson frame, an after-market frame, or build a chopper using a customized frame. The unique look of the shovelhead rocker covers will draw lots of attention at motorcycle rallies from Sturgis to Daytona Beach, no matter which frame and style you chose to build. The electric starter had originally been designed for use on a marine engine application, but was a happy addition to the motorcycles, in fact becoming a great improvement for those riders who were finding kicking the engine every time rather difficult and often tiring. With this change, more women began to become riders, another boast to the world of bikers. The addition of the electric start feature adding only a few extra pounds (about 10), yet make starting a cold engine much easier. Today, the shovel engine remains popular among classic motorcycle enthusiasts. These engines can be found in some really great looking motorcycles. You can also find them at times as just an engine or, more frequently, as a basket case. You can house your shovelhead engine in a stock Harley Davidson frame, an after-market frame, or build a chopper using a customized frame. The unique look of the shovelhead rocker covers will draw lots of attention at motorcycle rallies from Sturgis to Daytona Beach, no matter which frame and style you chose to build.